How is it possible to sincerely follow the teachings when we neither have a teacher close to us, nor belong a supporting group? In a recent teaching from a weekend programme in Barcelona, Sogyal Rinpoche gave this advice in response to a student’s question. 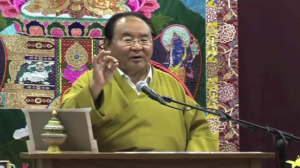 Rinpoche explains that in the absence of a teacher–especially for those of us in the modern West where there is not much of a tradition of following a teacher–that The Tibetan Book of Living Dying has been written in such a way that it is a whole spiritual education, and serves as a teacher itself.